I’ve been running in the Nike Air Pegasus 29 trail shoe for a while because they were bought when I didn’t know any better. Everything I read at the time of purchase said if you like the shoe you’re using for the road, you’ll like the trail version. I only ran in them a few times before putting them away, running on the road more than I wanted. Two years later (now) I have finally broken them in and invested in several different pair of trail shoes so I can compare. None of the running stores around here carry the heavy hitter trail shoes so getting them via mail was my only option. Saucony Peregrine is the only trail shoe I was interested in that was also available at my local running stores. My pair were bought from Fleet Feet, where I also work part-time, so the discount helped sway my decision a little. Plus my co-worker really loves the Peregrine, Saucony has a wide toe box which I like, so why not? I figure they can be my base line, the control group if you will. The Peregrine was purchased fourth but run in first; I ran in them a few times before the others were delivered. I gotta say, I noticed a big difference between the Peregrine and the Pegasus on the very first run: better grip; aggressive tread; solid rock plate; better drainage; rock stopper on the big toe; rubber along the front to give added strength to the upper when you trip over rocks and roots; only a 4mm drop from heel to toe; stretchy laces and just enough cushion to protect your foot from uneven rock landings. When I began my first run in them, I felt my foot move all over the place and thought maybe I had guessed wrong and gotten a half size too big (I wear a 7.5 in a road shoe, sometimes an 8). The route I chose that day was to first run a half mile over a bridge to get to the trail head on the other side. Once I got on the trail, the roominess of the shoe was forgotten as I maneuvered the technical trail system for 8 miles. I wear Injinji all the time because of sweaty feet and they are not thick so don’t take up a lot of extra room. Come to find out, a size 8 in this particular shoe is perfect since there is a lot of up and down hill and, as any trail runner knows, having your toe hit the top of the shoe is very uncomfortable and can result in black toenails. Having all that room in the shoe allowed my foot the space needed to adjust to the various foot positioning needed for a lot of lateral movement. The second time I wore these was when a group of us ran in 6″-8″ of freshly fallen snow while a friend of ours took pictures. They were fantastic. These shoes have tremendous grip with a solid rock plate. The cushioning is more toward the minimal side and, since bruising my foot pretty bad on a trail run in the past, I’m a bit paranoid so have opted for more cushioning than what most minimal shoes typically offer. I don’t want a ton, just enough to keep me from putting myself out of running for another 2 months. I do not recommend these shoes for someone running city trails, or who needs to do a mixture of road and trail running because the soles are harder, less flexible and the lugs are thick. Road running will ruin the lugs which will then ruin the point of the trail shoe. Peregrine is a solid trail shoe and for many who need a try on option from your local running store, these are your best option for technical trails. They might be too much for less technical dirt. Most of us have one leg that is longer than the other. Most of us also have one foot that is longer than the than other. For me, it’s my left leg and foot, the latter a half size bigger than its counterpart. I posted a couple months ago about the wear pattern on my shoes, that I was going to attempt to work on my form so my left foot also landed squarely on the forefoot. 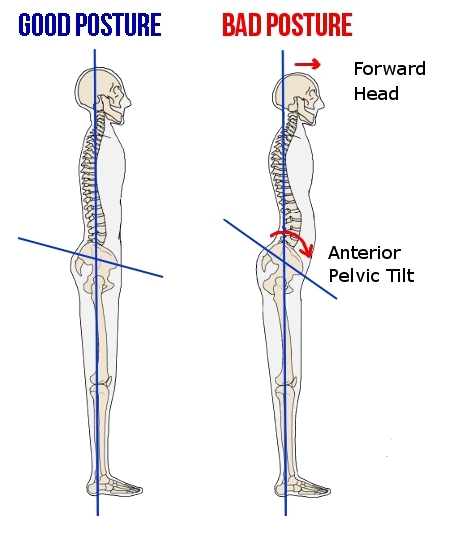 I have since realized a possible explanation for why I supinate on my left side is due to a pelvic tilt. By the looks of several pictures, I have an anterior pelvic tilt. That dude on the right, the one with the overly arched back? That’s how I am most comfortable when I am standing. And after doing some reading, I’m pretty sure I have a hip/pelvis imbalance caused by something in my hips or the actual pelvis. Visiting a chiropractor and doing a lot of exercises is the only thing to correct it, or at least an attempt to make it less severe. What it also means is being mindful of my posture when I’m sitting in my office chair, standing more while at work and getting up to stretch every hour. And those long afternoons knitting while watching bad tv will have to be interrupted by the occasional re-directing of the pelvis. It’s alotta work!